Clothing: He wears appropriate clothing for a young boy his age. He prefers wizard attire, to make it a point to purists that he's a wizard to. Introvert: Social situations drain him, though he will still be social despite this. He tends to be more quiet, thinking deeply about certain situations. Sensor: Practical solutions are what he strives for, not wanting to go too far from stuff that he doesn’t already know. Thinker: Honesty is something that he truly values. Feeling that avoiding the truth will only end badly in the long run, he is a bit harsh at times. Perceiver: Having options open to him, instead of having too much on his plate, is something that he greatly prefers. When opening up to people, Edgar can actually be quite casual and playful at heart. Decision making is not his strong suit, and big decisions tend to give him anxiety. Amortentia: Honey, and chocolate brownies. Patronus: Hasn’t cast one yet. Boggart: Edgar I pointing a wand at him as hatred shined in the old man's eyes. Hobbies: Not really, perhaps reading? Pets: An owl named Poe, after Edgar Allan Poe. He felt the name was slightly ironic. 1873: Edgar Charles Rey is born into the world. 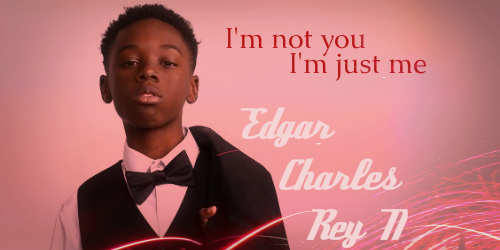 His blood purist grandfather is insulted that the boy is named after him, as Edgar Rey I does not wish to share the name what he deems to be a 'mudblood' and further disgrace to the family. His Aunt Guinevere and her family, his grandmother, and his parents are thrilled to have him join the family. 1875: He gets a baby sister, and sees it fit to start calling her Bell, a shortened version of her name, Bellerose. 1876: Edgar shows his first signs of magic by making a bag of sweets float to him that his mother said that he had to save for later. 1877: He is disappointed when his next sibling turns out to be another girl, but finds it interesting as how similar she looks to father. 1880: Cousin Ace goes to Hogwarts, and is sorted into ____. 1882: Avril follows Ace to Hogwarts, getting sorted into Ravenclaw. 1883: Leroy is off to Hogwarts, going into Hufflepuff. 1884: Edgar is disappointed and frustrated when learning that he can not go to Hogwarts yet, feeling slightly insulted that the school wouldn't let him go just because his birth day was after the start date. After all, he was still turning 11 that year, and thus sees it as unfair. He also thinks that if anyone should be held back a year, it is King, thinking it would give him time to gain more confidence. 1885: Edgar finally gets to join his cousins at Hogwarts. The hat hesitated a little bit between Gryffindor and Ravenclaw. Sometimes he gets comments that he should have been a Ravenclaw. 1886: The young Jolie joins the bunch at Hogwarts, and it is Ace's last year. Edgar could tell that his sister is also upset by not getting to go the year she turns 11, do to her birth date. 1887: Ace graduates, and it seems their aunt is very happy about this. Disaster strikes during summer, as they lose both Leroy and Charles. Aunt Guinevere pulls Avril out of school and into the Pendergast Rose (though she doesn’t get in for some reason, so is homeschooled instead), though Avril seems to not be very happy about this. And now his little sister is joining him in school this new year, and is sorted into Hufflepuff. March 22, 1888: Uncle Ryder is dead. March 23, 1888: Cousin Roselle is born, but Aunt Guinevere had passed away. March 25, 1888: Ace obtains guardianship of his younger siblings. Edgar can't imagine how that must feel. February 1, 1889: According to the Daily Prophet, Aunt Guinevere might be alive? Thanks guys, good to know that everyone's top priority is to keep him in the loop. There has been lots of loss in the family recently. His father is a squib and his mother is a muggleborn. Aunt Jade and Grandfather Edgar hate his branch of the family due to purist views. His cousin Ace and his branch do not approve of these views. This is their paternal branch. His uncle Ryder was a werewolf, though he and his branch of the family have no knowledge of this. “Perhaps you could comment if I’m about to mess up?” He suggested.